Access Books supplies school libraries with brand new hardcover books, but we prefer to build classroom library sets with donated books. That's where you come in! Consider sponsoring an underserved school by running a book drive on its behalf. Examples of past sponsors include schools from affluent communities, corporations, individuals, Scout troops, and high school students working on community service projects. Please email lkampfner@accessbooks.net if you're interested. ​We work with the sponsor group (you!) and the school in need to choose a service date. 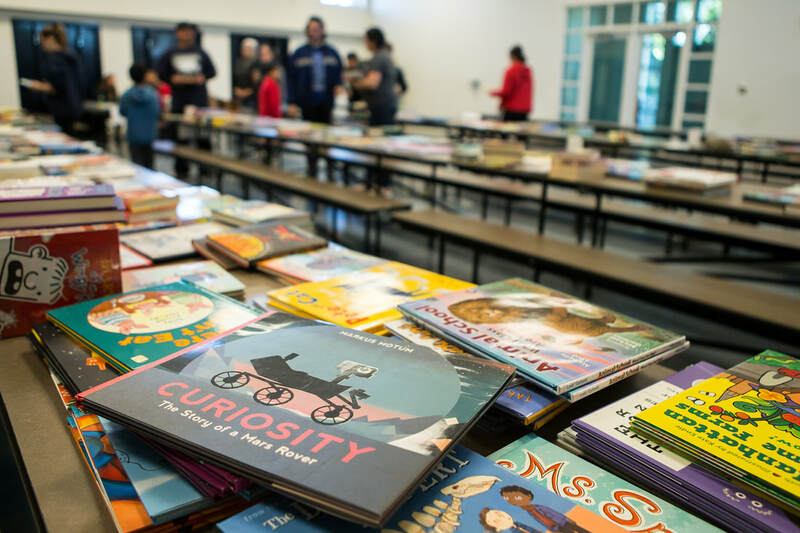 In the weeks or months leading up to the event, your group collects gently used, high-interest books appropriate for grades K-5. We ask that you set a goal of at least 2,000 books (the more, the better!). On the designated day, usually a Saturday, your group delivers its books to the school in need. We ask that you bring about 15-20 volunteers. Your group and volunteers from the recipient school will work side by side to build classroom library sets from the donated books, process the brand new books provided by Access Books for library circulation, and paint literacy-themed murals. Volunteers from your group get the chance to see where the books go and report back to their home school, organization, etc. It’s also a great way for employees from donating companies to participate in a team-building exercise or volunteer opportunity. Watch an Access Books library event in action! We thrive on the partnerships built, the students working together and the importance of access to literacy. One of the most compelling aspects of Access Books is the emphasis on building bridges between different communities. If you would like to sponsor a school in need, please contact us: meghan@accessbooks.net. To learn more about Scout service, and our Access Books Fun Patch, click here.